01:48 — Doctor Who: Eighth Doctor gets new costume. 04:22 — Death: Graham Crowden is dead. 05:41 — The Hobbit: More casting news. 08:25 — Tron: More casting news for Tron Legacy. 10:36 — Merlin: Commisioned for a shortened fourth season. 13:45 – The Sarah Jane Adventures: The Nightmare Man. 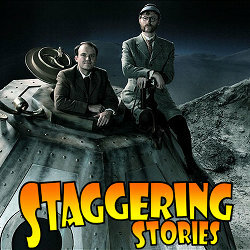 31:45 – Mark Gatiss’ H.G. Wells’ The First Men in the Moon. 63:46 – Farewell for this podcast! 64:15 — End theme, disclaimer, copyright, etc. Adam J Purcell, Andy Simpkins and Keith Dunn sit down, undead, in front of the third episode of the 2005 Doctor Who revival, The Unquiet Dead, and spout our usual nonsense! NOTE: apologies for the sub-par sound quality, our mics were running a bit hot considering how boisterous we became! BBC: Doctor Who – The Unquiet Dead. Welcome to the sixth Doctor Who Podcast Alliance joint podcast. 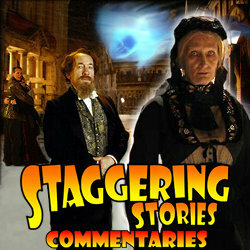 This episode was recorded at not one but two Doctor Who related events. 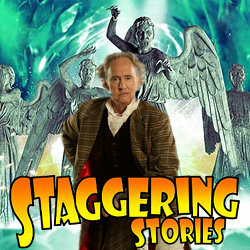 The first was Doctor Who Live: The Monsters Are Coming at Wembley Arena, as attended by James from The Doctor Who Podcast and Keith and Adam from your very own Staggering Stories. 01:33 – SJA: Death of the Doctor discussion. 38:47 – Doctor Who Live discussion. 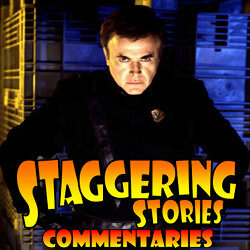 Adam J Purcell, Andy Simpkins and Keith Dunn sit down, bestered, in front of the first season Babylon 5 episode, Mind War, and spout our usual nonsense! The Lurker’s Guide to Babylon 5: Mind War.